YouTD is my recent project and the topic of my bachelor's thesis. As you might know, I have already made a high quality TD (eeve! TD), but YouTD will be something totally different. I might even say, YouTD is something very different from every other TD ever created. Once it is finished, it will be the most sophisticated Tower Defense ever made. The whole mapping community will have the chance to design towers and items for this Tower Defense. By using my script interpreter GMSI and the web interface, people can create towers and then upload them onto this page. Here, towers can be seen by other people and be discussed. Once an admin approves a tower, it will be automatically put into the next release of YouTD. People can even download the uploaded towers to learn from others. The map offers an extremely sophisticated trigger engine that allows tower creators to make really unique abilities with just a few lines of JASS code. Creating a chainlightning that can critically hit: 0 Lines of code(!) Every spell in YouTD is able to critically hit by default. This is no joke! All these attributes, where each of them is hardly used in ANY TD at the moment because they are normally to complex to be triggered, can be coded with just 1-3 lines of code by using the YouTD engine. You will see towers with effects that have never appeared in any TD. 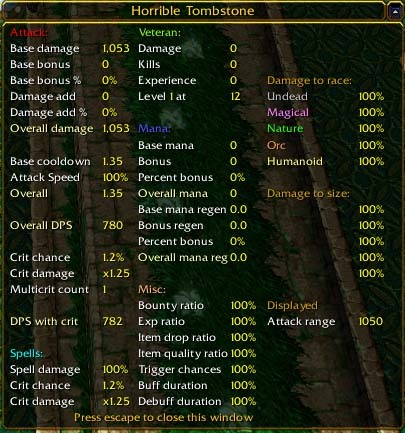 Here is in ingame screenshot of the values that a tower has. As you can see, towers have really much things to be altered! I hope I could show you how mighty the YouTD engine is. But as I just said, I want to give the whole map making community the chance to create content for this masterpiece TD. Some vJASS knowledge. However, if you don't have this yet, then you might learn it, I really require the very basics of vJASS like structs for example. If you have these skills and you feel like creating a tower for this TD now, then welcome! However, if you miss one of these skills, but you still have a good idea for a tower, then don't hesitate to post it in the forum. Maybe someone else will like your idea and implement your Tower. Next, I have written a comprehensive HowTo that explains how you can create a Tower for YouTD and exploit every small feature of the YouTD engine. If you want to create a tower for this TD, then read it thoroughly!